As you all might already know, the TA300 uses a USB cable instead of the traditional TCP/IP or RS232/485 cable. The type of USB cable used for communication is called the Standard-B plug. The Standard-B plug cable has a square shape with bevelled exterior corners. The cable is plugged into the "upstream receptacle" on a device that uses a removable cable, most noticeably for printers. On some devices, the Type B receptacle has no data connections, being used solely for accepting power from the upstream device. This two-connector-type scheme (A/B) prevents a user from accidentally creating an electrical loop. Q1: How do I enroll a user with the administrator privilege in TA300? A1: You can enroll an administrator by using Fingerprint /Card / Password. The administrator’s user ID must be 8888. Q2: How do I change the TA300 terminal’s language? A2: You can change the terminal language by pressing 5555 and then the press the TimeSet button. Select the language by using IN and OUT button and press the OK button to save the changes. Restart the terminal for the changes to take effect. Q3: I am getting an error message when performing the terminal activation. Unplug the TA300 cable from the PC. Uninstall the TCMSv2 software and restart computer. Install the latest version of TCMS V2 software and restart the computer. If you are using Windows 7, please right click at the TCMS V2 setup file and select run as administrator to install the software. You can download the latest version TCMS V2 setup file at: http://www.fingertec.com/download/FingerTecTCMSv2Setup.zip Switch ON the TA300 and plug the USB cable to the computer. Please wait while the OS detects the terminal. Right click on the TCMSv2 icon and select run as administrator. Then perform the terminal activation. If problem still persists, please follow the steps below. Quit the TCMS V2 software. Restart the computer and start up the TCMSv2 software and perform the terminal activation. if i have done all the instructions in A3 but the 199 : connection error still occurs. What I need to do? Please arrange team viewer session with our support team at support@fingertec.com for us to do the remote checking. Hi, I have a re-installation of TCMS software because of disk space problem to my server, every time i enabled the device i got the same error on Q3 even though i'm using a device AC900. i able to ping the IP of mention device but still it doesn't work. Kindly check the IP Address and make sure there is no other device or PC use the same IP Address. Other than that, also make sure your Product Key and Activation Code are same as on software installation CD. If you not confirmed, please provide us the device Serial Number, so we can generate the product and activation code. I am using the TCMS V2 software and just update the new version by using the "New Release" icon, then run the programe again a message like "Required Active X is not registered properly or is outdated! Please make sure you run as admin". What is the solution ? Please uninstall your TCMSv2 software, then reinstall again using below setup file. For your reference, please follow below step. 1- Turn off the PC anti-virus and firewall. 2- Un-install the TCMSv2 software without removing the existing TCMSv2 folder. 4- Install the latest setup file at existing TCMSv2 folder. 5- Then right click at the TCMSv2 icon, select run as administrator to open the TCMSv2 software. Should I backup the system data before reinstall? Dear Ruby, you can manually backup the software, by copying the TCMS folder in your local drive to another location, before uninstalling the software. By right, if you do not delete the TCMS folder in your local drive, no data will be lost. The folder is located in your Local Disk C > Program Files (x86) > Fingertec Worldwide > TCMSv2. I need back all system data, if I reinstall without backup, can the data keep as use after installation? For information, you still can keep the old database when you uninstall the TCMSv2 software, as long as you not deleted the TCMSv2 folder file. Please provide us the device serial number, before we can generate the Product Key and Activation Code for you. Regards. How can it found the serial number? Hi.. You can found the serial number sticker at the back of terminal. Otherwise you can check inside the TA300 terminal by press 9999 > TimeSet > 9999 > TimeSet > Device Info > Serial Number. You mean I can found it on the card reader? Yes, you can found serial number behind the reader. Otherwise you can check inside the TA300 terminal by press 9999 > TimeSet > 9999 > TimeSet > Device Info > Serial Number. Do you mean these S/N#7309383, 7309384, 7309385, 7309386, 7309387? Hi Ruby, yes, you are right. No can you provide us with your company name, and email address, so that we can send the product key and activation key for you? Dear Ruby, I have sent the product key and activation code to your e-mail. Kindly check it. Thanks. Thanks for your message. Already receive your email. Does we need to reset all setting after reinstall the programme? Dear Ruby, You do not have to reset anything. May I know why are you asking to reset? I don't want to reset, as we didn't have a IT expert to fix this problem, so just want to ask more details for reference. Thanks in advance. Our company will change the working hours in July, please advise the procedure for changing the roster or add a new roster in system? Can we setting in advance or must set in 1 July? Will the previous records change at the same time after we changed the tine in roster? I merged two cards number into one without print the time record, I want to get back the old record. Can I undo it or how can I find the time record for the old one? Hi Sir, Good day to you. Do you mean, previously you've already assigned two card number using the same user ID? May I know which time attendance software you are using? TCMS v2 Software or Ingress Software. In order for us to assist you further we recommend that you email to support@fingertec.com. Good day. For your information, once you merge 2 users in TCMS, data from both user IDs will be merged too, into the user ID that you have chosen. You can check the data availability by going to Devices > Terminal Data Audit List > Select the new User ID > Key in the date range > press Enter. If the data is available in the Audit List, you can retrieve the data in Attendance by re-generating the attendance sheet (Attendance > Generate > Select User ID > Select Date Range > Generate). I want to create a new admin, how do I go about it? Hi, can I connect 3 unit TA300 to PC at the same time..? Unfortunately, you can only connect only one unit of TA300 to the PC at one time. If there is any other information required, do let me know so I may assist you accordingly. Need to reset the admin code on my TA300. When I go to add a user and type in 8888 nothing happens. So I just to reset the device or any suggestions you have. Thanks. Referring to your problem, the only way to remove the Administrator status from the terminal is by using the TCMSv2 or Ingress software if your terminal is connected with the TCP/IP. Refer http://tips.fingertec.com/tcmsv2/clearing-admin.pdf for more information about to clear the admin using the tcmsv2 software. In case you didn't connect it to the software, please contact your reseller, they will help you to reset the administrator privilege at the terminal because only reseller have the authority to reset the administrator privilege at the terminal. Thanks. how to reset the user id....i have forgotten the id and password? Hi, kindly help send the product key. We lost the other one. Kindly zip the whole TCMSv2 Folder (C:\Program Files (x86)\FingerTec Worldwide\TCMSv2) and screenshot the error message. Then email it to us (support@fingertec.com) for further checking. Thanks. Hi can you send product key please. Please refer to the information below for the TCMSv2 activation code. If you need the TCMSv2 activation code, you can retrieve at http://user.fingertec.com/retrieve_key_user.php. Our system will automatically generate the activation code. Hi Could you help me. 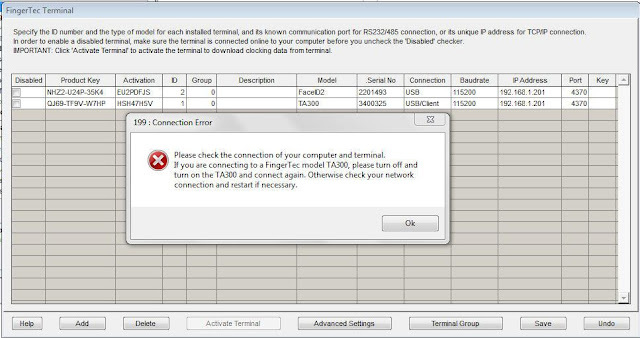 Im using model TA100 but always pop up error 199. I did all your comment. That error pop out because there is no connection between your device and software. color screen reader : press terminal menu > system > reset > reset all default setting > restart terminal. black & white reader : press terminal menu > option > system option > advanced option > reset option > restart terminal. Resetting the terminal will cause all your settings to return to the original factory settings. color screen reader : press terminal menu > comm > network > ip address. After done change the ip address, go to the computer > open command prompt > ping the ip address. If get reply, please use the device info tool to read the terminal information. Please download the device info tools from the link below and follow the step. b - Double click to run the tool. c - Insert the IP address of your device into the IP column. e - Tool reads into device and display the information. f - You can check your device details as Serial Number, firmware version, Product etc. If the device info can read the terminal information, that's mean there have a connection between the computer and the terminal. If not, please check your network setting. Refer http://tips.fingertec.com/hardware/01connect/connec-throu.pdf for more information for an example of connection through Ethernet. After the device info can read the terminal information, please synchronize your fingertec terminal with the tcmsv2 software. Refer http://www.fingertec.com/customer/download/postsales/SUM-TCMSV2-E.pdf at page 8-18 for more detail about the installation and activation. Please notify me if the solution works for you or otherwise so I can assist you better. Thank you and have a nice day. Hi, kindly help send the product key. Our computer breakdown so need to install back again the problem we lost the other one. As requested, I have send the Product Key and Activation code for your terminal to your email onesimustan@gmail.com. Regards. Our system will automatically generate the product key and activation code. If there is any other information required, do let me know so I may assist you accordingly. With regards to your query, may I know which software you are using to connect to TA300? Did you check on Data Audit List in the software and also you need to generate attendance sheet once you downloaded data from device. Please let me know further details on your issue along with related screenshot and email to support@fingertec.com so that our support team can assist you further. My TA300 device cannot be activated. It shows 199: connection error. I have tried all the above solutions and it doesn't work. What should I do? Regarding the error message that you're facing, it indicates that your PC can't establish connection with the terminal. Therefore, you are not able to download the attendance from the device. In this case, if the issue still persist after you follow all the instruction, kindly contact your reseller to check your device condition at your site. Maybe there is a problem on certain part or USB cable that you are using. If you do not know your reseller contact details, please provide us your device serial number so that we can trace your local reseller. The serial number can be found in the device's menu (Menu > Sys Info > Device > Serial Number, or you can check it at the back-side of the device.